Salt Awareness Week is an annual campaign, run by Consensus Action on Salt and Health (CASH), to help reduce the amount of salt in our diets and, as a result, improve public health. Since its inception in 1996, a lot of progress has been made – a number of foods are now 50% lower in salt than they were 10 years ago. However, many of us are still consuming more than the recommended maximum intake of 6g of salt a day, which means that there is still work to be done. 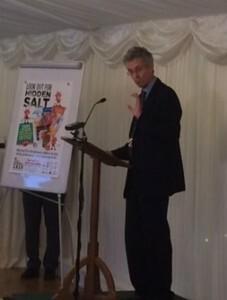 [Professor Graham MacGregor, Chairman of CASH] It is now 20 years since it was first set out to reduce salt in the UK. We are still well away from the 6g max per day – we all have a responsibility to read food labels and choose foods with less salt. 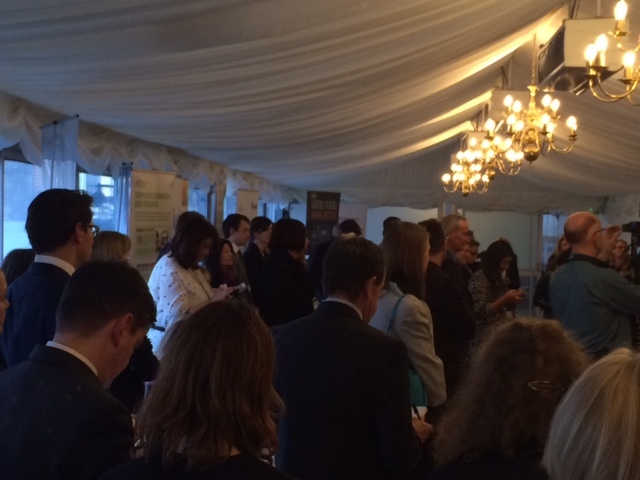 The House of Commons reception is an opportunity for Industry & MPs to join and discuss the future of salt reduction in the UK. Exhibitors this year included Co-op, Waitrose, Subway, Kudos Blends, Low Salt, McCain and Stroke Association, with many other supporters of the week itself. 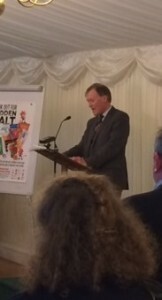 [Sir David Amess, MP] CASH survey – released at the start of salt awareness week found that salt had increased in popular supermarket foods: Canned Tomato Soup, White Bread, Cheddar, Cornflakes and Chilled Ready Meals. Some were found to contain more salt that a Big Mac or slice of Dominos Pizza and bread is one of the largest contributors of salt in the UK diet. The Responsibility Deal is to blame. Since 2010, the food industry has been policing itself and little has been done to reduce salt in products. When the FSA were responsible, they set targets for 86 categories resulting in salt reductions that effectively saved the NHS £1.5 billion. Decreasing salt by just a pinch a day can prevent 4,000 deaths from stroke every year. Urgent action is needed to improve the nation’s health and an independent agency needs to be responsible for setting targets for salt, sugar and saturated fat. 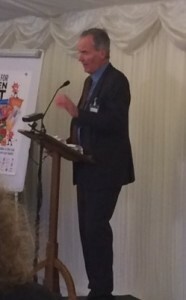 [Lord John Krebs, Former Chairman FSA] 2003 SACN report on salt & health found that reducing salt would benefit everyone not just hypertensives. Salt was the cheapest way to flavour food that had none or little flavour – so the food industry were concerned that consumers wouldn’t like it. One year later came the “Sid the Slug” TV campaign after which major retailers noted that consumer queries were mainly about salt. Reducing salt then became a marketing advantage, so despite a 15% reduction in between 2003-2011 it is disappointing that 20 years later efforts have slowed or reversed. More must be done whether it means working with industry or regulation. There needs to be more use of food chemistry/sensory techniques to look at salt alternatives more creatively. Salt is one of the easiest nutrients to reduce, but there should also be focus on fat and sugar – dietary disease is just as much an issue as alcohol and smoking. 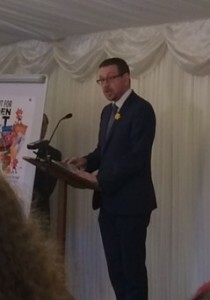 [Andrew Gwynne, MP] Between 1998-2000 salt in cereals decreased 44%, 2004-2008 salt from out of home purchases decreased one third. It is sad to see this has slowed – the Responsibility Deal has failed and we have seen those steps forward made going back again. It is hoped that when the Childhood Obesity Strategy is launched – that it will tackle high salt food. Labour opposition will do all that they can to make sure Government steps up to its responsibility. They will support Government in making sure messages are heard and in legislation if it’s needed because the public health gains are too important. [Professor Graham MacGregor, Chairman of CASH] In the 20 years since CASH was set up, we now know that diet is the biggest cause of death/disease. Nutrition was taken away from the Department of Health to the FSA – this was a great move in reducing salt in the UK. Around the world, approx. 70 countries have copied the UK plan with slight modifications such as regulation. Many members of industry would prefer legislation – as this creates a level playing field. Andrew Lansley restructured the health service, introducing the Responsibility Deal and putting the food industry in charge. This hasn’t worked. The latest NDNS 24 hour urinary sodium excretion result will be available soon and using this CASH will be able to calculate the number of deaths that should have been prevented since the control for salt reduction was taken away from the FSA. The Responsibility Deal was under the coalition government so is now finished and nothing is happening. Hoping that this year there will be positive news from the Prime Minister.